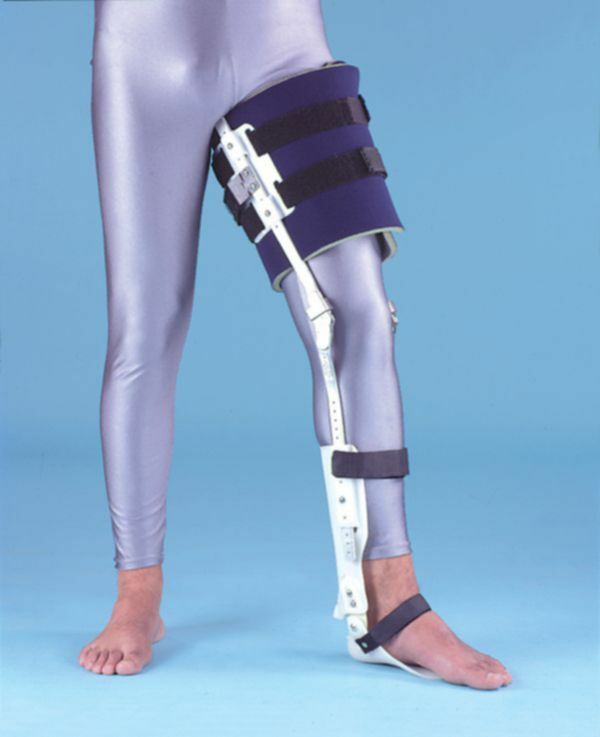 Thigh-ankle brace made of light aluminium with ankle joint and elevating spring. Thigh-ankle brace made of light aluminium with ankle joint and elevating spring, Cletzak type, which allows the free flexion of the foot up to 900. Duralumin stabilizers are lined with leather with Velcro closures. The orthoses is combined with correctional straps with hip support, knee joint with or without safety block, extra pads for the knee joint and correctional straps for the ankle joint (Cletzak type). Indications: middle or lateral control of the flexion – extension of the knee and the ankle joint as well as some control of the sciatic position.